Oats infected with Crown Rust. Lower leaf senescence is due to rust infection, not maturity. Poor conditions during the fall planting window have made cool season forages a somewhat scarce commodity this Spring. Producers fortunate enough to have cool season forages, need to take the necessary steps to allow them the maximum returns from their plantings. 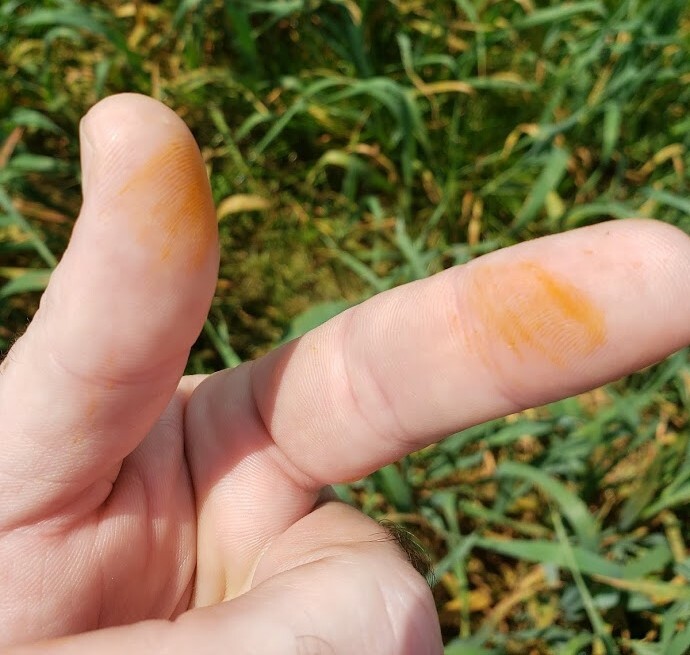 For producers growing oats, one of these steps is to be on the lookout for rust. Crown Rust (Puccinia coronata var. avenae) is an unwelcome but common fungal pest of oats and other forage crops. Even though conditions have been fairly cool and dry (rust prefers warmer, wetter conditions), observed populations in the Central Panhandle have increased and spread quickly in recent weeks. Producers need to scout fields regularly for rust. From the truck window, a building rust infection might be dismissed as lower leaf senescence associated with plants reaching maturity, nutrient deficiency, or some other innocuous stress response. However, if time is taken to really get out and look rust is easily identifiable by the raised, orange pustules that easily wipe off the leaves. While rust can be found on the top and bottom of leaves, it tends to be found first and in greater amounts on the underside of leaves. Another reason to get out and really look through the canopy. Even though most oats in the area are beginning to reach maturity, scouting is still important. The presence of rust will greatly increase the rate of leaf senescence – forage quality (and eventually quantity) will crash much faster than it would if the plant matured under normal conditions. There are very few fungicides labeled for use on forage crops. This late in the growing season their use would be highly cost prohibitive, and likely ineffective. Despite the lack of fungicide options, rust is relatively easily managed in grazing scenarios. If rust is present at any appreciable level, graze off the infected plants. This is not a permanent fix, but it does remove most of the inoculum, greatly slowing the spread of the disease, and will allow for clean regrowth. If your farm is properly equipped, green chopping can be utilized in the same manner as grazing. If silage, baleage, or hay is the intended use for the crop the decision-making process is more complicated. Generally speaking, total production or yield increases every day an annual forage crop gets older, until full maturity is reached. Conversely, forage quality tends to decline as the crop matures. Harvest timing is always a balancing act, trying to maximize forage yield without sacrificing too much quality. Add rust to the equation, and the balancing act is still the same but the speed at which conditions change greatly increases. In relation to crop maturity, there are two common harvest times for oats. 1) The boot stage – adequate yields and very high forage quality. 2) The dough stage – yield is maximized, and sufficient quality is maintained. Without disease pressure, forage quality declines gradually from the boot stage through the dough stage and then falls off sharply. With a rust infestation forage quality can begin to fall off sharply, much earlier and much faster. Harvesting the forage early (boot stage) can sacrifice potential yield, but with a rust present delaying harvest until the dough stage can result in very poor forage quality. Think of the harvest in terms of pounds of nutrients/ton (CP and TDN), not the number of rolls. Waiting to harvest for the sake of a few extra rolls can potentially result in a harvest yielding less total nutrition. To further muddy the waters, the situation described above implies rust is an all-or-none proposition. That is not the case. The rust pathogen must physically spread through a field. Depending on environmental conditions, rust can spread very fast to not at all – back to the importance of scouting. Harvest decisions should be based on the condition (maturity, disease pressure, etc.) of the entire field, and maximizing the total value of the harvest. For example, a ½ acre hot-spot of rust in a 40 acre field may not warrant an earlier-than-planned harvest. However, it should be carefully watched because that ½ acre could turn into the majority of the field in just a few days. It should be noted that oat varieties vary greatly in their susceptibility to various strains of rust. The susceptibility of the variety you have planted can greatly affect if and how rapidly rust will spread through your fields. Currently, the only oat variety on the market that is resistant to all know strains of rust is the Legend 567. See Cool Season Forage Variety Recommendations for Florida for more information on variety selection. Rust is present and moving in this area. 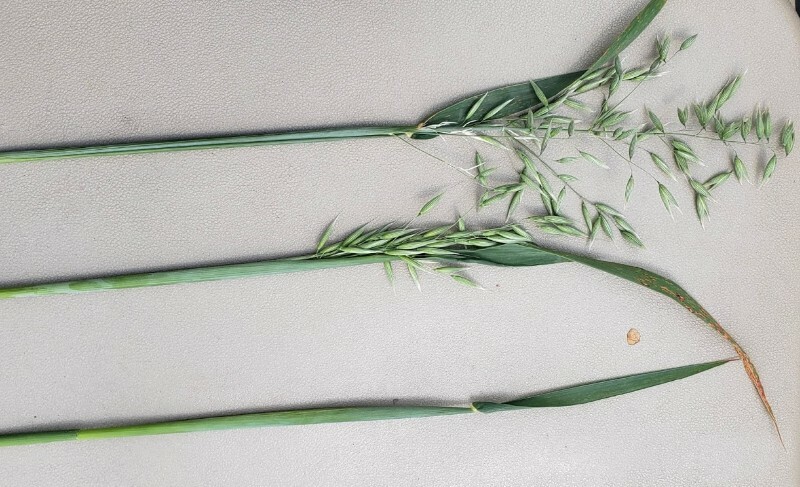 Scout your oat fields diligently, and be ready to respond if you find rust. 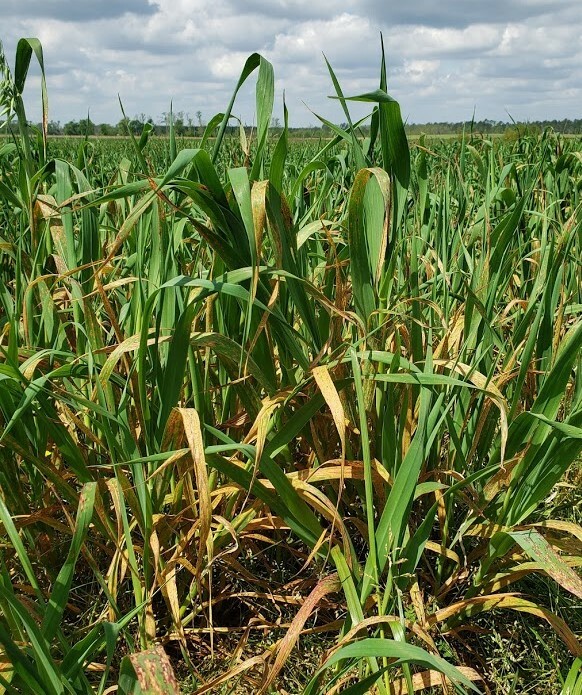 Don’t let an unnoticed late season disease rob your forage quality. For more information of assistance scouting your crops for disease, contact your county’s UF/IFAS Extension Office.